Sagga Boy: Sagga was a short, frail man who earned his name from the way he walked. He was afflicted with a severe hearing problem which affected his balance and as a result when he walked he staggered about. One day a salesman who delivered goods to shops in the district saw Sagga staggering up the road and not being aware of his problem remarked, " Every time I come up here this man always drunk". Sagga was a remarkable man despite his challenges. He was self schooled and earned a living giving private lessons. He was the best draughts player in the district. He was good at dominoes also. Stanley Bull : A loud mouth, big voice man. His mouth was as big as his voice. he took delight in making-up big words, especially when drunk e.g laborsted - big. Bolo: An old fisherman who really looked the part; he was never seen in shoes. Yank: A short red man; he was the district butcher; he spoke in a hoarse manner as though he would lose his voice at any moment; he was known for cutting out worms from the feet of sheep. William Cuhper: A knocked kneed man; he walked as though styling because his knees were so badly knocked. He loved cricket and was a fervent supporter of Sussex. Every Saturday he could be heard shouting instructions at the top of his voice to the team. "One in and one out, double swing the ball". Cyril Wukkie: A curly headed, fair skinned man; was drunk more often than not. Brocks: he was a fisherman. he walked with a hop and a drop because one leg was shorter than the other. He never troubled or disrespected anyone; he drank quite a bit. Cocky King: an ecky becky; a very serious man who could tell some tall tales; he took his life with a shot to the head. Gordon Tom: a small slim man; he always carried a stick; known for trickery; he died on the veranda of the community centre one night while a dance was in progress. Bulla Rouse; a short man; it is alleged that one day he had given away or gambled out all of his week's pay so he decided to trick his wife to cover for not having any money. It is said that he sat in the doorway so that when his wife tried to pass she accidentally touched him with her foot. His response was "yuh kick me, yuh kick me! Not one cent today". Pyum Hunte: He had difficulty walking.He used to get around with the use of his bicycle.He would ride it or lean on it for support when walking. Children would say to him, " I want a ride" and he would reply "yes, but yuh din say when". Black Bird: An old lady who used to fret when people shouted, 'Pee,Pee Black Bird" . She was married to Red Porgy. Red Porgy: A red man (of very clear complexion). He would fret when called Porgy. He was married to Black Bird. Nockie: Nockie was a small,slim man who drank a lot.He was also called Bluffer or Backer. He got the name Backer because one day a friend was in trouble and turned to him and shouted "Backer". Instead of helping he responded, "Up in day" and fled the scene. After that when anyone said to him "Backer" he would respond, " up in day". Tommy Griffin: He was a big, tough man. He was a mason and was always scruffy, with the cement on his hands and face. He is remembered for a remark he made once when his church members were condemning the pastor who had been accused of having an affair with one of the church ladies. His reaction was, "chuh, wuh he in do nuh more than another man would do". Whitehall: White Hall was a quiet man by nature. He walked very slowly and gingerly. He loved to talk dirty. He enjoyed telling the young boys about his exploits with women. In his old age he walked around with a condom in his pocket and would occasionally take out the tattered condom to show the fellows. Test- I : He was usually drunk. He always put packages in his shirt, which made him look like he was pregnant. Granville; He was one of the village barbers. It is said that he used to turn down a bowl over his customers head when cutting their hair. Cliffy Rudder: Cliffy spoke very quickly. It was extremely difficult to understand what he was saying but he loved to talk. He had the habit of asking between sentences,'"What uh tell yuh?" And he would wait until you told him what he had said. Because of this you were forced to listen to him. Coajuh; He was also known as Sam-G. He loved to frequent the dance halls in the early days. Once a group of women from town came up to Sealy Hall Casino and decided to target him for heavy spending. He could soon be seen, head bobbing, moving across the floor. One woman was heard saying, 'wackup punnee and mekkee feel sweet". Booksy Sealy: Booksy had very poor eyesight. He was a tall well -set man. He pretended that he could see better than he could; that he did not need help. This sometimes left him in a compromising position. Sugar: A loner. He was a strange, crafty guy. He did not leave home. He would stand outside his house with his hand behind his back, watching every body who passed by. He was a rotund figure and wore a goatee beard. One day he asked a fellow to pick some coconuts for him and as the guy tossed down the nuts he counted each. "One , two, three, four five ,six, seven and the one in muh mout mek eight". Needless to say one of the coconuts had landed in his mouth leaving his mouth swollen. Johnny Roberts: Johnny was a loner. He was the church sexton for many years ( over 50 years).He felt proud ringing the church bell especially on special occasions such as Xmas Eve- midnight mass, when the church was packed. Johnny somehow fancied himself a preacher and would conduct services from his home in the still of the night. He imitated the priest - Rev. Brathwaite to a T. People throughout the district could hear him "loud and clear" as he went through the entire ritual. Silford: Silford was a very serious man. Very few people messed with him. One day his pig ate one of his ducks. He responded by chopping up the pig with a hoe, saying, "Eat my F'-ing Duck?". It is said that he then went around trying to get people to buy the pork. Jim Reeves/ Barabbas: Jim was a local white who owned a shop which was run by his wife. For years everything was what it should be until one Sunday, Jim drove up the street in his van blowing the horn and revving up loudly. He was drunk. It was the first time that the neighbourhood had seen him drunk and behaving in this manner but it was not to be the last. From then on he would display this drunken behaviour. He would come home drunk and chase everybody out of the shop. He would curse his wife( a lady who was respected by all) stink, stink and demand that she close the shop. This was done regardless to who was there.The loud revving of the engine was the signal that trouble was up. He called himself the mayor of Blades Hill. Micky: Micky was a man of very clear complexion. It was said that Micky who worked on the plantation could not read or write. One day the book-keeper decided that the workers would have to sign for their wages. This sent a chill down Micky's spine. That day he allowed all the other workers to go up before him. When it was finally his turn, he took his wages but refused to sign saying angrily, "I had to work so hard fuh dis money and then stan up here so long waiting for it...I in signing no book', and left. Salty: Salty was always dressed in a khaki shirt and a khaki short pants. He never wore shoe. He owned two donkeys and cart. 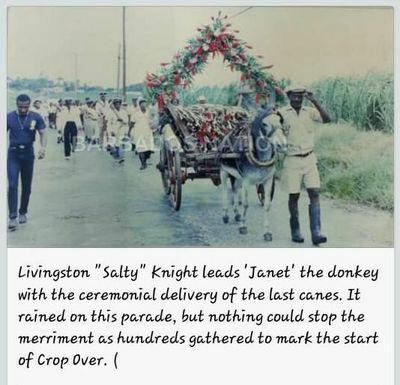 He used to haul canes for the small growers.His donkeys and cart were used on festive occasions (Crop Over) by departments of government and were captured in many pictures on tourism brochures. Dorothy Knights: Dorthy lived with Granville, opposite Sugar. She and Sugar were always at war. People said that she was an obeah woman.She always sprinkled funny smelling liquids around her house. Infact it was only in her old age that residents realised that she was from Trinidad. It is reported that she went back to Trinidad but no one seems to know for sure. She is remembered for her fish cakes and bread. She could not be beat for the roundness and the crispness of her fish cakes. Piggy Tone: Piggy Tone and his wife were small elf-like people.They lived in Blades Hill opposite Percy Inniss. Both he and his wife were from Panama. All the children in the district were afraid of them. Piggy Tone had hair growing out of his ears and nostrils. He and his wife were hardly ever seen out of the house. Pot Washer: a short brisk walker; he walked with a pronounced head and neck movement; nobody realy knew where he came from,; he was probably from St. John. Fiddle: she walked with a hop and drop; seemed semi-retarded; she would appear a few times a year; some of the fellows are reported to have taken advantage of her. Millie Gone To Brazil: a short woman who walked with a pronounced swagger; she took snuff which could always be seen around her nose;she used to fret when called Millie gone to Brazil. Eril Husbands: a short man from Massiah Street in St. John. ; he used snuff which was always around his nostrils; he was known fo rolling his tongue when sounding words with 'r' and always greeted you with rhymes. One of his regular sayings was:'you rrrright , you rrrright like shite'. Unknown woman: There was this woman who would appear once or twice year; she would be heard saying, "Repent, repent; the Kingdom of God is at hand." There have been 22 visitors (63 hits) to this page today. Updated and current.